Sorry about the bait-y title. No, I'm not sorry. Well, I'm slightly apologetic. The problem, according to Crawford, is that video games are, from the most expensive blockbuster shooting game to the humblest text adventure, fundamentally about spatial reasoning, not social reasoning. It does seem striking that most games are based on spatial reasoning. Without space, StarCraft is basically rock-paper-scissors. Without space, Civilization and other games turn into giant spreadsheets. Without space, Chess and Go, some of the oldest games that are still popular, are gone. This dependence on space makes games with a social story seem almost infeasible (imagining how to make a gamebook interesting without space is something I struggle with). Alongside that, there's the difficulty of social mechanics. I spent some time thinking about this and I realized that it's almost impossible, given our current technology, to make a single player game with meaningful social mechanics. That's a far-reaching claim; here's how I came to it. In most games, we combine a numerical element (this weapon does X damage, this farmer produces X crops) with a spatial element (I can build a fence here, I can move troops here). Space naturally makes some of the gameplay interesting (I can hide behind this wall and not take damage, I can put these two farms together to make them more efficient but I need to make room to expand later), and the numbers generally add on top of each other to make things interesting as well. The cool part about space and numbers is that they create opportunities for emergent behavior - stuff that grows out of the original mechanics. In Civilization II, your troops were safer if they were stationed on a mountain (their strength numbers were higher). Combine that with a narrow inlet with just a mountain, and suddenly the spatial mechanics and numerical mechanics create a higher-level concept - a choke point (you could arguably call this a dynamic if we're talking MDA). This emergent behavior makes a game's possibilities multiply. There are only 64 spaces on a chess board, and only 6 types of pieces, but combining the spatial rules and the numerical rules (logical in this case - how pieces capture each other and get promoted), you have a game with billions of possibilities. If you imagine the game as a tree of possibilities, a game with space and number combined grows very quickly - that enables emergent behavior. Even tic-tac-toe has a lot of possibilities. Here's the problem. 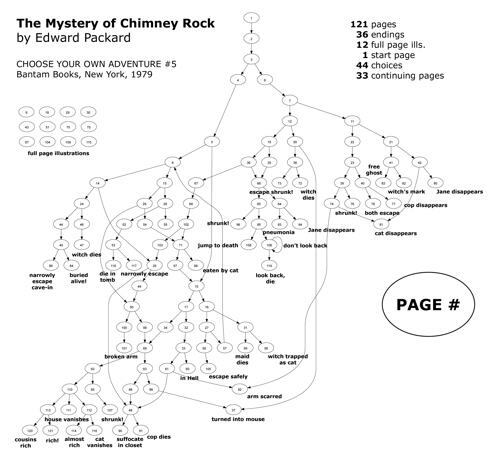 In Choose Your Own Adventure style gamebooks, you have to write every branch of this tree yourself. No matter how many branches you can make, you'll never be able to keep up with a system with the slightest bit of emergence. Someone had to write a page for every one of those branches, and that still would be smaller than 4x4 tic-tac-toe. Social mechanics are not at the generative, emergent stage; they're mostly at the branch stage. When I interact with characters in a game, usually it involves a branch that someone had to write, script, and record by hand (think any of the Bioware RPGs, any RPG character dialog tree, or any Twine conversation, visual novel, etc.) Games that have genuine social models are rare and often super simplified (think of the Sims, or the idea of foreign civilizations "liking" or "disliking" you in any Civ game). Emergent behavior is what makes games interesting. Instead of flowing down a tree that's only interesting once, you're putting elements together in new ways. You're generating freeze-shatter combos in an RPG, or holding choke points in a strategy game, or building a pit to fill with lava. In a game with a tree, the question you ask is "What paths did the designers make the best/most interesting? "; you're guessing what they had in mind. In a game with emergence, the question you ask is "How can I combine these elements in a cool way?" You're inventing. This is the great difficulty with social games - we don't have good ways of modeling social behavior - and honestly, I don't know if there's a good answer to it, at least in the single player realm. Thoughts? Re: Is it even possible to make SP games with interesting social interactions? But let's put this elephant in the room into the corner, at least for the moment. Can systems do a better job of storytelling than crafted content? Historically, no, and while we certainly shouldn't use that as evidence that there's no point trying, it's hard to see how any technology short of a magic futuristic AI will be able to beat the problems they demonstrate. The first of those is that any story, any setting, any characters, and any mechanic gets old fast, as indeed seen by Levine's own BioShock. The first presented us with one of gaming's most imaginative, best realised locations, only to have fans yawn at the idea of returning to it for BioShock 2. There are certainly systemic games that can keep people's interest in the long run, but at most they sprinkle bits of lore and a premise into their worlds and focus on being a stage for stories rather than actually trying to tell one. When they try, we get MadLibs, with the resulting stories passing muster because either everyone is meant to be impressed by too the technological achievement to spot the lack of fun - Skyrim's Radiant AI for instance, or the older AI-driven adventure Sentient - or the effect is entirely reliant on the atmosphere. Spy games Sid Meier's Covert Action and Floor 13 spring to mind as short-lived successes. Once the 'I am a ruthless secret agent' vibe fades though, everything is quickly laid bare. As humans or human-like infiltrators from the planet Zorgoth as the case may be, we're fantastically good at spotting patterns and figuring ways to use and abuse them, even at the cost of our own fun. I think the upcoming Cyberpunk 2077 might have interesting social interactions. I'm just making a guess judging by what the devs are saying and how the limited gameplay trailers look like. Probably not to the extent that you're describing, but at least more interesting than most games. I've heard good things about them, but I haven't played any CD Projekt games in depth enough to know if they can pull it off. It'll be interesting to see what they make of it.